“Storytelling.” It’s the flavor of the day, whether you’re talking about content marketing, visual communications or public relations, and for good reason. Stories are how humans communicate – with each other individually, across populations and over centuries. In fact, many organizations are pretty good at identifying and defining their key story lines. The key to success in brand storytelling is in the next step – the strategic deployment of the story. Telling the brand story effectively requires a plan. And to be clear, we’re not talking about hanging a touchy-feely post up on the blog and then calling it a day. No. Brand storytelling, in this context, means developing a sustained plan to create and execute a strategic approach to telling the brand story, in a way that supports company’s objectives. Personally, I don’t give a hoot about impressions. Let’s gun for something a bit more meaningful. Developing the brand’s key themes is the first step, of course. Those central themes can then form the backbone of the communications strategy and the organization’s editorial calendar. The themes effectively become a message framework and provide contextual hooks for the organization’s communications, ranging from PR positioning to the content the brand develops for campaigns. Once the themes are defined and the framework is in place, the marketing and communications teams should next think about developing a cadence of messages that define, describe, support and prove the brand stories. Creating a comprehensive editorial calendar that blends PR, content marketing, demand gen, social and sales enablement is the key to actually telling the brand story effectively, across all communications disciplines. Thinking in terms of stories will get the marketing team closer to the customer and help the PR team refine and improve their pitches. Next time you’re looking at a list of key message points and value propositions, challenge yourself to also find the related stories the target audience cares about. That inflection point – where the brand message meets the audiences’ interests – is the center of the opportunity for the brand. As you map the plan, challenge yourself to think beyond the company’s usual communications tactics and channels. For most brands, text communications – press releases, blogs, papers, and social updates – form the core of the PR and communications output. However, audiences are demanding visual content, and the algorithms that dictate what people see on social networks and in search engines feed that demand, giving visual content more top of page/top of news feed visibility. Additionally, our audiences are more fragmented than ever, using multiple channels to find and consume information. Telling the stories and conveying these messages in a variety of formats and across a variety of channels is important, for a few reasons. First, repetition helps messages stick. Developing a cadence of content to support key messaging drives overall visibility for the story, and improves audience retention. Additionally, a variety of channels will require the organization to use different formats – video, slides, text, tweets, images etc. In addition to broader reach, different formats aid message retention. People have different learning styles (auditory, visual, kinesthetic, etc.) meaning they absorb and retain information in different ways. Employing a variety of different content formats will help messages stick. Together, the messages your brand publishes tells a story. That story can either be disjointed, or it can make sense. By creating a message framework and developing an integrated editorial strategy, the brand will provide a coherent user experience for the audiences, telling a cohesive story that makes sense. The coherent message structure also delivers other benefits to the brand. It reinforces key messages, delivering evidence and credibility that can influence analysts, journalists, bloggers and – very importantly – early stage prospects who are in research mode, and haven’t yet identified themselves to the company. A strong message framework also delivers significant benefits to the internal organization. Sales and client services teams absorb and share the information, providing important training and reinforcement to staff learning and sales enablement support. Brand storytelling isn’t something that’s achieved through a single blog post. By building brand stories over time, adding chapters along the way, organizations can deliver robust and effective messaging that builds social proof and earns credible attention among key constituents. Effective storytelling delivers more than fleeting impressions: it can (and should) be measured in impact top line results, such as improvements in search rank, conversion rate and lead score quality. What is public relations? If you ask three PR pros that question, you’re likely to get four different answers. The profession is in flux as it strives to catch up with (and get ahead of) the swift evolution of today’s media and information markets. However, if you step away from the swirling amalgam of earned media, digital content, social networks and online influence and instead focus on the audience, the answer to that question – what is PR? – becomes clearer for your organization. The whole point of public relations is influencing audience behavior, wherever those audiences live [tweet that!] crafting a brand image that ultimately inspires desired outcomes. Twenty-five years ago, the primary means of communicating with audiences were fairly limited – advertising, direct marketing and mass media were the core channels. Obviously, today, it’s a much different story. Audiences are in control of what information they consume, and when, and how – at least, to the extent the algorithms dictating what people see on media sites, search engine results and social media feeds allow. This environment has given rise to a whole variety of new influence factors, targeting opportunities, content formats and a seemingly infinite array of digital channels and environments where the brand’s publics live. Viewed through this lens, public relations looks a lot more like marketing than it ever has. It’s also inherently more measurable, too: web analytics and other measurement tools make it entirely possible to correlate and connect outbound messaging activity with audience behavior and business outcomes. Clearly, if the charge of public relations is to influence audiences, the PR practitioner needs to orchestrate strategies and campaigns the reach far beyond traditional channels. 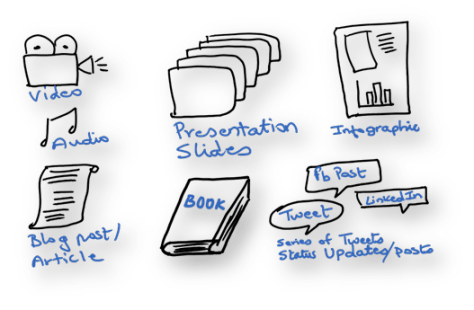 Practically speaking, communicators need big toolboxes and the ability to tailor the tactical approach for different messages. On a tactical level, this means making specific decisions about the treatment of different messages and campaigns, starting with the required business outcome, identifying the related audience and engineering the communications strategy accordingly. Important business stories absolutely merit the full PR treatment, with pitches to A-list media and a full court PR press. However, the PR pro also needs to use strong news judgment and find ways to tell brand stories when media coverage is less likely, which in turn requires the communicator to have an ever-larger tactical toolbox at hand. These changes have ushered in an important new strategic requirement, as well. The days of running a calendar full of episodic PR campaigns are over. Digital content has a long lifespan, and the content a brand publishes has an accretive effect, meaning brands need to make developing a coherent and connected digital presence that builds (and continually reinforces) the brand’s credibility, reputation, visibility and relevance to the audience a strategic priority. On the macro level, “public relations” starts to look a lot more like marketing at this juncture. Developing compelling content that tells the brand story, cultivating relationships with influencers, developing and growing the digital audience, earning credible media visibility and tying these activities to hard business outcomes are all part and parcel of public relations today. 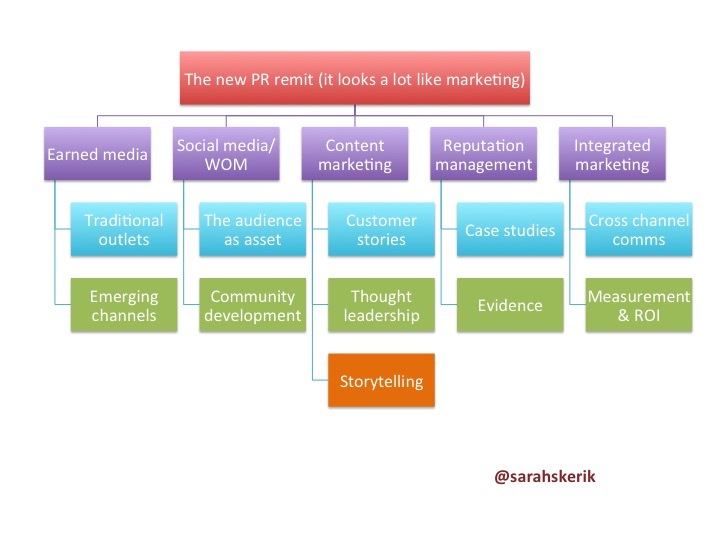 Furthermore, the expansion of the PR remit also requires communicators to integrate their efforts (and calendars) tightly with the wider marketing organization, to gain marketing efficiency and create longer runways for important brand initiatives, generate leads and continually build the business. Ultimately, this means the brand’s PR and marketing lead needs to have an innate feel for the audience, an understanding of the mechanics of influence, real social media fluency, digital marketing know-how and the ability to translate visibility into quantifiable results. Digital influence is a big job – and an even bigger opportunity – for PR pros and the brands they represent. Maintaining clear focus on the audience is the key to delivering meaningful marketing and communications results.